Beat mascarpone, heavy cream, espresso powder, vanilla, sugar, and cocoa powder in large bowl on low speed. Scrape down bowl, then gradually increase speed until mixture stiffens and forms peaks. Spread a thin layer of whipped cream on the bottom of springform pan, then cover it with a layer of cookies, leaving as little space bare as possible. Break cookies into pieces to fill any gaps. Spread an even layer of whipped cream on top of cookies, then top with another layer of cookies. Continue this pattern until you nearly reach the top of the pan, then end with a layer of whipped cream. Cover cake with plastic wrap and refrigerate overnight. To serve, run a sharp knife along sides of the pan to loosen cake, then remove sides of the pan. 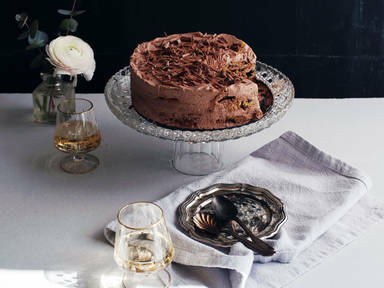 Shave some chocolate on top of cake using a vegetable peeler for garnish before serving.